These rapid (emergency) assessment tools can be used to help assess water supply, excreta management, solid waste management, hygiene and disease vector control conditions in the following refugee settings: These rapid (emergency) assessment tools can be used to help assess water supply, excreta management, solid waste management, hygiene and disease vector control conditions in the following refugee settings: Camps; Settlements; Transit Centres; Schools; Health Centres and Urban Settlements. It also contains references to UNHCR’s WASH indicators and recommendations for data collection. Tags: Boreholes, Drilling, and Water Prospection and Investigation. 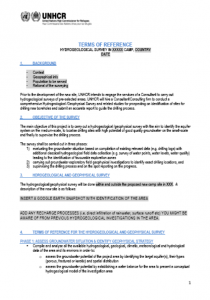 DatabaseDocTypes: Hydrogeological Surveys. 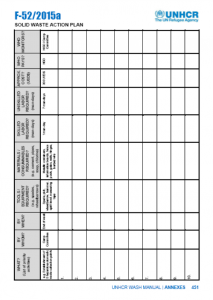 Categories: WASH Emergency Guidelines, WASH Emergency Guidelines, WASH Policy Guidelines, and WASH Terms of Reference. 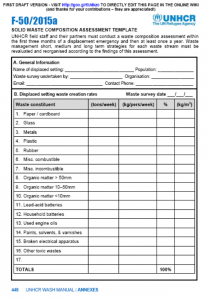 Tags: Landfill Management, Landfill Management, Landfill Management, Medical Waste Management, Solid Waste Management, Solid Waste Management, Solid Waste Management, WASH Assessments, WASH Assessments, WASH Assessments, WASH Assessments, Waste Recycling , Reuse and Reduction, and Waste Recycling , Reuse and Reduction. 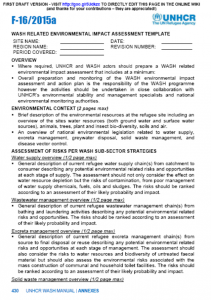 Where required, UNHCR and WASH actors should prepare a WASH related environmental impact assessment. This template should be used to assist in the process. 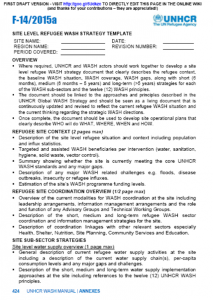 Where required, UNHCR and WASH actors should work together to develop a site level refugee WASH strategy document that clearly describes the refugee context, the baseline WASH situation, WASH coverage, WASH gaps, along with short (6 months), medium (6 months – 5 years) and long-term (>5 years) strategies for each of the WASH sub-sectors and the twelve (12) WASH principles. 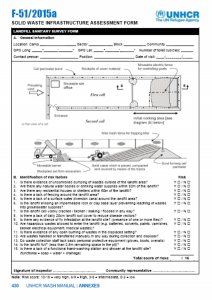 This template can be used to help produce the site level WASH Strategy. 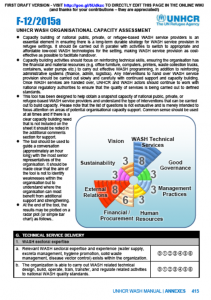 Tags: WASH Monitoring, WASH Monitoring, WASH Monitoring, WASH Monitoring, WASH Monitoring, WASH Programme Management, WASH Programme Management, WASH Strategy Development, and WASH Strategy Development. 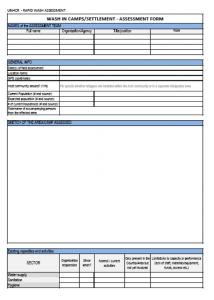 This tool has been designed to help obtain a snapshot capacity of national public, private, or refugee-based WASH service providers and understand the type of interventions that can be carried out to build capacity. Tags: Capacity Building, Cross Cutting, Cross Cutting, Cross Cutting, Cross Cutting, WASH Coordination, WASH Coordination, and WASH Coordination. Languages: English, English, English, English, English, English, English, English, and English. Organisations: UNHCR, UNHCR, UNHCR, UNHCR, UNHCR, UNHCR, UNHCR, UNHCR, and UNHCR. 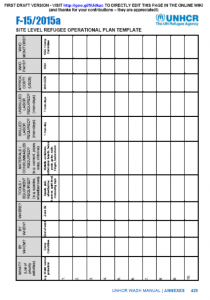 Categories: WASH Reference Documents, WASH Reference Documents, WASH Reference Documents, WASH Reference Documents, WASH Reference Documents, WASH Reference Documents, WASH Reference Documents, WASH Reference Documents, and WASH Reference Documents.